Did you know I lived in California for a few years when I was very young? We’re talking early 1970s here in case you can’t tell by the car, my Mom’s hair, and our dresses. I think we look very cute, but I’m amazed at how very short my dress is. It’s practically a shirt. lol! We are standing in front of a home that we rented in California. It is probably the earliest home that is in my memory. My aunt found a picture of this home in a stash of old photos that gives me a better view of the place than I can remember. We lived in several apartments before this, but I don’t seem to have any mind pictures of those. It’s remarkable that I can remember anything about this house because I was only 3 when I lived there. I did celebrate my 4th birthday there, but I think we moved fairly soon after that. 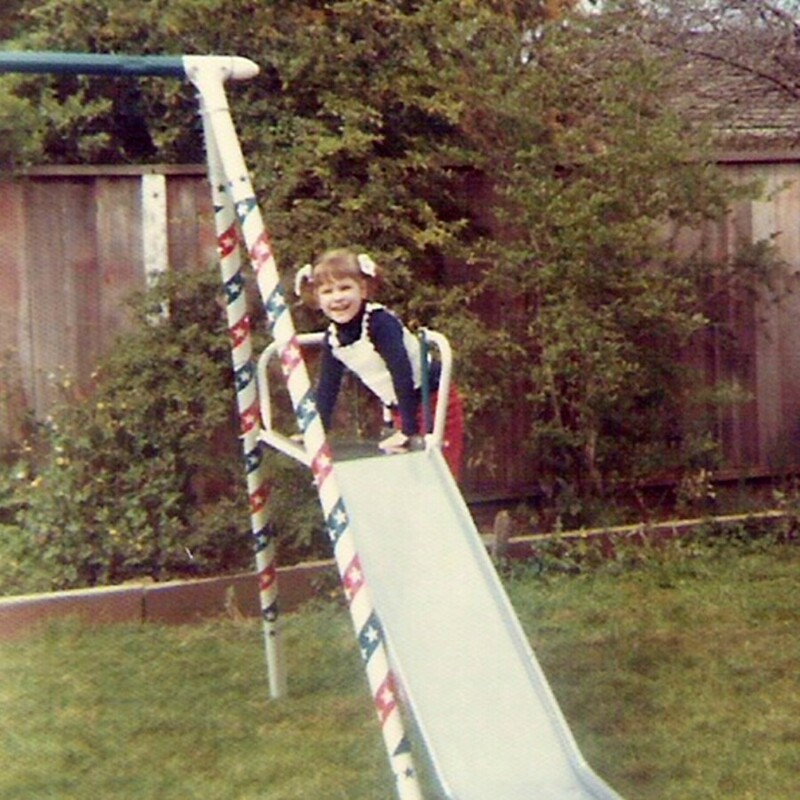 This is me on my 4th birthday with my new swing set. The garden out back. I remember picking peas and eating them straight out of the pod. I thought that was the coolest thing in the world that I could eat them right out of the ground. I have a vague memory of lying in a bed underneath a pink and green quilt made by my mom. I remember having a picnic table in our kitchen. It was a neat wooden one that my Mom had painted because she was crafty like that. I know that part of the reason I remember this is because of this photo. 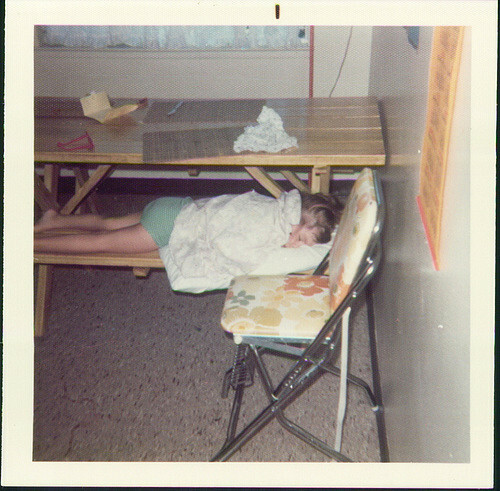 I vaguely remember being in trouble with my Mom and feeling angry about sitting on that bench, then being surprised that I fell asleep on it. It’s a very fuzzy memory. Isn’t it fascinating to try and piece together our earliest memories? I remember when my own kids were little, I would constantly wonder if they would remember the things that were happening right then. What would stick out in their minds later on? What would their earliest memories be? I don’t think my husband remembers anything from such an early age, at least not that he recognizes. I wonder if some people have a better recollection of early memories than others? Of course, seeing photos helps a ton. I don’t have many pictures from this time but these do help jog my memory. Can you imagine how different it will be for future generations that have oodles of photographs documenting where they lived and what their life was like from the beginning of their existence? Such interesting things to think about on a Memory Monday. I challenge you to write down some of your own earliest memories, whether or not you have pictures to go with them.